One of the more popular versions of eschatology, especially within evangelical and fundamentalist circles is premillenial dispensationalism. This view has developed only recently (1830s) but became very popular due to the spread of the view in Scofield's Study Bible. The tragedy is that many of the advocates of this view are not familiar with its recent historical origins. If they were, they would likely have reservations accepting such a recently developed eschatology. For those unfamiliar with the view an article by Jay Rogers (The Forerunner) does a very good job presenting it in an easy to understand format. This is the too often the entire scope of eschatological debate among today’s Christians. Dispensational premillennialism is the view of most 21st century evangelical Christians. Indeed, most would be surprised to discover that the great figures of the Christian faith, such as Athanasius, Augustine, Luther, Calvin, Wesley, wrote absolutely nothing on the “rapture” nor the “seven year tribulation.” Such ideas were foreign to them. Dispensational eschatology, with its elaborate prophecy charts and theories on the “mark of the Beast,” appeared on the scene as recently as 1830. Yet it did not become a prevailing view until the beginning of the 20th century. I begin with this point of rebuttal. If a doctrine is new, then it probably isn’t true. For 1800 years, Christian orthodoxy prevailed without encountering the elaborate prophecy charts devised by followers of Scofield and Darby. While the classic premillennial view separates the second coming and the judgment by 1000 years, dispensational premillennialism a view never heard before 1830 separates these two events by 1007 years. Dispensationalism teaches, in effect, three Second Comings: the coming of Christ for the saints at the rapture; the coming of Christ to the earth at the end of the seven year tribulation; and the Father’s coming at the end of the millennium. Dispensational premillennialism is the eschatological view furthest from postmillennialism. Here there is the strongest disagreement. The two views are furthest apart on the theological spectrum. We disagree not just in views of the “end-times,” the rapture, the antichrist, the tribulation, and the millennium, but even more fundamentally on the method of interpreting the Bible. The two approaches to scripture are so radically different that postmillennialists and dispensational premillennialists have entirely different worldviews. Dispensationalism is derived from the idea that God has worked in different ways throughout history through different economies or dispensations. A dispensationalist makes a severe division between the Old and New Covenants, God acting with wrath and vengeance in the Old Testament and with love and grace in the New Testament. Dispensationalism teaches the imminent “secret” rapture of the Church, divides the end times into several dispensations, and teaches a conspiratorial view of history with evil forces rivaling the forces of God. John Nelson Darby, founder of a group called the Plymouth Brethren in the 1830s, is the father of modern dispensationalism. Darby taught that the Second Coming of Christ was imminent. He rejected the creeds of the early Church and believed social reform to be useless. C.I. Scofield, a Texas pastor, popularized the teachings of J.N. Darby in a systematic theology known as dispensational premillennialism. C.I. Scofield first compiled his reference Bible as a teaching aid for missionaries. It soon became one of the most widely used tools for Bible study among entire denominations such as Southern Baptists and Disciples of Christ. Despite the fact that many of the early dispensationalists were orthodox Christians, this shift in theology paved the way for an much greater error, antinomianism, which means literally “anti-law.” Antinomianism states that since man is saved by faith alone, and since faith frees the Christian from the law, he no longer bound to obey the law. Antinomianism creates a false theological system in which the laws of the Bible cannot apply to governing the individual or society. Dispensationalism promoted antinomian thinking by de-emphasizing the relationship of the Old Testament law to the individual under the New Testament. In turn this led to a waning influence of Christians in society, since most of the laws pertaining to civil government are found in the Old Testament. To the orthodox Christian, the unity of the covenants of Scripture and the moral law of God are obvious foundations of Christian social order. The covenantal idea of God’s unchanging eternal covenant and a corresponding high view the moral law of God, stand in stark contrast to dispensationalism and antinomianism. The dispensational theory of premillennialism has gained great popularity mainly among modern evangelicals. The dispensational view of premillennialism, with its elaborate conspiracy theories, time tables, charts and graphic scenarios, is essentially a chiliast error. It has been most often accompanied by the false notion that the Second Coming is a predictable event with an identifiable time-table. This is despite Christ’s warning that “it is not for you to know the times or the seasons” (Acts 1:7). The fascination with the exact date of the Second Coming always appears as history approaches years with big round numbers. Chiliasm reappeared shortly before 500, 1000 and 1500 AD. Not surprisingly, we saw a reemergence of this error in full force as we approached 2000. Financially profitable publications advancing theories and speculations on the Second Coming are appearing everywhere. In contrast to Christ’s biblical admonition against predicting the time of the Second Coming (Mat. 25:13), many evangelical books authored in recent years have predicted the exact time of the Second Advent, for example: Hal Lindsey’s Late Great Planet Earth, Edgar Whisenant’s, 88 Reasons Why the Rapture Will Be In 1988, and Harold Camping’s1994, which was a best seller in 1993, and the novel series, Left Behind, by Tim LaHaye. However, now that we have passed the millennial milestone of 2000, many Christians are reconsidering their eschatological viewpoint. Many Christians have been taught that geo-political Israel would be a focus of end-times events. Seeing now that over 50 years have passed since the establishment of a Jewish nation-state, many are reconsidering an alternate interpretation of both the Mount Olivet Discourse and the book of Revelation. In the historic view, the covenant and the law of God have always been the obvious foundations of a godly social order. Covenantal theology laid the groundwork for a political theory which held that the family, the church, civil government, and all society came into being as a contract on the basis of God’s eternal covenant. Hence, the moral law of God must be the foundation for a society’s laws and civil order. The Puritans held to this covenantal or “federal” theology which maintains that God operates through covenants, or eternally binding legal agreements with men. The Old and New Covenants are God’s basis for governing the universe. There is no division between the Covenants. The New Covenant is built firmly on the foundation of the Old Covenant. This presupposes that the Law does not change: “Do not think that I have come to abolish the Law of the Prophets; I did not come to abolish, but to fulfill” (Matthew 5:17). God is not a dispensational, evolving, developing God; He is a God that never changes: “Jesus Christ is the same yesterday, today and forever” (Hebrews 13:8). This is true of both the Old and New Covenant. We have in the Bible 66 books that are really one book. We should interpret scripture with scripture. Daniel, the Mount Olivet Discourse, and the book of Revelation are commentaries on one another. In essence, Revelation is the capstone of all biblical prophecy pointing to the timing of the coming of the Messiah in the first century. If we understand Revelation as being John’s commentary on the same events described by Jesus in the Mount Olivet Discourse, then a mostly preterist perspective is the only approach that makes any sense. I believe that most of what is written in the book of Revelation was fulfilled in 70 AD. Yet the first time I heard this idea, I was shocked that anyone could propose such a theory. However, when I began to study church history, I began to understand more about the context in which Revelation was written. I was then introduced to some solid preterist commentaries on Revelation and found solid confirmation. We are not headed toward an end-times tribulation. This has astounding implications for how we should live our lives. Scofield and Darby wrote in the 1800s that since the time was so short and since evil was on the rise (so they thought) Christians ought not involve themselves in social or political issues, but ought to be concerned instead with the saving of souls. Dispensationalists have taught this for over 170 years. Thus pessimistic, conspiratorial thinking has become a kind of self-fulfilling prophecy. Christians have retreated from involvement in the world because of a faulty theology that states that the world is predestined to get worse and worse. And because of this retreat, the world has become worse in many respects. The default of Christians on many social issues has led to increasing godlessness in western societies. But all this can change if enough evangelicals make the necessary paradigm shift toward a vibrant, robust covenantal theology. What the nations of the world experience in the next few years will largely depend on the obedience of Christians to the word of God. In my rebuttal to classic premillennialism, I argue that the purpose of the book of Daniel is to point the Jews to the exact time and circumstances surrounding the coming of the Messiah. The main purpose of Daniel’s prophecy is to point to the first advent, not the second advent. Further, the context of 1 Corinthians 15:23-25;50-54 indicates a simultaneous Second Coming and final judgment. So what about the rapture? Is the rapture secret or not? Postmillennialists believe in the rapture. We simply do not believe in the dispensationalist version of this great event. The rapture is synonymous with the resurrection of the righteous. However, this event will not be secret. It will not occur seven years prior to a future millennium, nor 1007 years prior to the final judgment. Postmillennialists believe in the rapture. We believe it will occur at the time of the Second Coming, just before the final judgment,after the millennial reign is complete. Waugh writes: “The rapture HAS to happen BEFORE the Great Tribulation.” As an apparent proof text, Waugh quotes the question asked by Christ: “But will the Son of Man find faith on earth when He comes?”(Luke 18:8). Waugh wants to believe that the Son of Man will not find faith on the earth when He returns. Yet we postmillennnialists see great victory for the Gospel in history. “‘The days are coming,’ declares the Lord , ‘when the reaper will be overtaken by the plowman and the planter by the one treading grapes. New wine will drip from the mountains and flow from all the hills’” (Amos 9:13). Obviously, postmillennialists don’t interpret Luke 18:8 in the negative. The whole context of this parable is that it is to demonstrate that we always ought to pray in faith and never to grow weary of praying. The question, “Nevertheless when the Son of man cometh, shall he find faith on the earth?” is demonstrative rather than interrogative, that is, the answer is not “yes” or “no.” The question concludes the parable as a rhetorical device. We as Christians must pray in faith and never grow weary. We are commanded by our Lord to pray even if the answer to prayer is late in coming, even until the time when the Son of Man returns to the earth. The preterist view of Revelation — that it was to be a warning and an encouragement to the early Church that was about to face the wrath of Nero and the Roman armies — would makes little or no sense unless the church at that time understood it as such. Is there any evidence that they did? Ironically this question exposes the error of the futurist viewpoint. It recognizes the need of Revelation’s relevance to its first century audience, which preterism fits perfectly. Revelation’s warning about Rome and the coming Jewish War are matters found not only in this book. The same warning is given the Olivet Discourse (Mat. 24), the parables of Jesus (Mat. 20-23), and various warnings of impending judgment elsewhere in the New Testament (2 Thessalonians; Hebrews; James; 1 Peter). The question should be asked whether Christians understood those references too. We know that the early Christians understood the coming judgment upon Israel and Jerusalem. Eusebius mentions the Christians in Judea escaping as the Jewish War broke out. Later commentaries on Revelation indicate that its events refer to the Jewish War. For example, the Syriac versions of Revelation mention it was written under Nero; Andreas and Arethas of Capadocia and the Sibylline Oracles also refer to Nero as the Beast. With the developments in the Middle East, with terrorism on the rise, a war in Afghanistan, and Iran and Iraq’s possession of nuclear technology to destroy Israel (and all the power plays concerning that) is there going to be a future final conflagration? Yes, but it occurs at the end of the millennium, not at the beginning (Rev. 20). Further, it will occur after a time of “peace and safety” not as the culmination of many years of “wars and rumors of wars.” Since we are not anywhere near the end of the millennium (neither from a premillennial nor postmillennial view) I do not see a brewing war in the Middle East as a possible fulfillment of Revelation 20. According to Rev. 20, there a war between the rebellious among the nations of the world and Christ himself. It will serve to separate the wheat from the chaff on the earth in just before the final judgment. It will occur among all the nations of the world. Many preterists see the events in Rev. 16 (the Battle of Armageddon) as having already taken place at the time of the Roman siege of Jerusalem in 70 AD. In any case, Revelation 16 and 20 are not about geo-political developments in the 20th century Middle East. Dispensational premillennialism presents a worldview in diametric opposition to postmillennialism. Dispensationalism teaches, in essence, that evil is a greater force than good in history. Current world events are interpreted in a conspiratorial light. The church as a whole will fall into apostasy and will fail to fulfill the Great Commission. Christ will appear with an angelic cavalry with trumpets blaring to rescue a remnant. 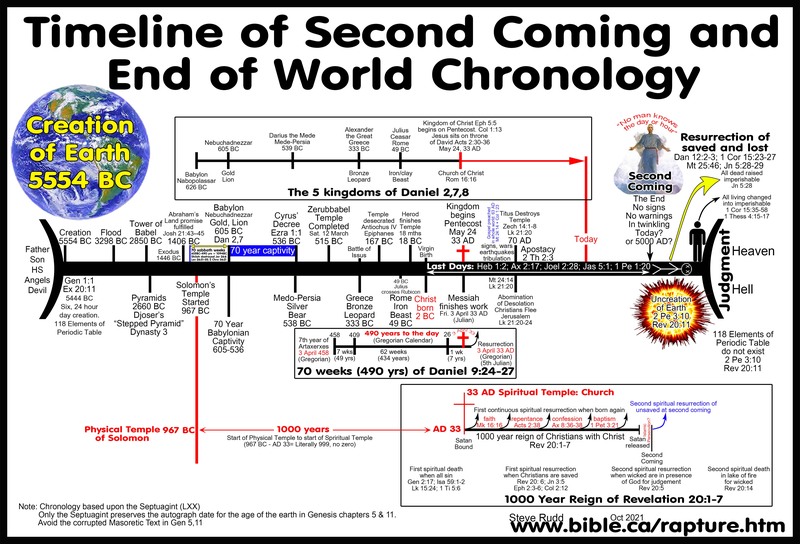 Dispensational premillennialism places the Church in a position of an “evangelism-only” role in the End Times (since Christ’s Second Coming could be very near, it is necessary to save as many as possible while there is still time left); it places the appearance of the Antichrist’s one-world-government somewhere during the last seven years of time; and it usually involves a Great Tribulation in the last seven years of time, during which the Church is to be raptured, or physically caught up to be in heaven with Jesus. At the end of this Tribulation Period, the Second Coming occurs and the saints who were caught up to be in heaven for a period of time return to rule and reign with Jesus on the earth. Postmillennialism places the Church in a role, not only of evangelism, but of discipling the nations as well (not only will many be saved, but whole social structures will be transformed); the rule of the Antichrist is more loosely interpreted as the current world system of Satan which is being overthrown by the progressive, sovereign judgments of God; thus “tribulation” is viewed, not as a seven-year time period, but as the sum total of all the judgments of God in history, and although the rapture is not usually focused upon, it does occur at the very end of the millennium when Jesus returns physically to the earth and the saints are simultaneously caught away to be with Jesus. Before the Second Coming, the Church’s role is to rule with Christ, not in heaven, but as His ambassadors on earth. Your view of the end-times will affect how you view current events and it will even greater affect how you respond to the call of missions. If your worldview is dominated by conspiracy, then you need to change your thinking to allow the Providence of God to have full reign in the course of history and in your life. Many Christians today read Scripture through a theological paradigm that was unknown prior to the nineteenth century. This view, called dispensationalism, introduced such concepts as the pre-tribulation rapture and third-temple Judaism in the millennium. However, eschatological novelties are not the most important differences between dispensationalism and historic Christian theology, many of which are not trivial. The controversy raises questions about the nature of the kingdom of God, of the church, and of the gospel itself. Though originally viewed with suspicion by many conservative Christians, dispensationalism subsequently acquired mainstream status among evangelicals and is seen by many as the very definition of biblical conservatism. The views of John Nelson Darby, the system’s founder, have been propagated through annotated study Bibles, best-selling novels, radio and TV personalities, numerous Bible institutes, and seminaries. Dispensationalism has become the official theology of some of America’s largest evangelical denominations. To some, its presuppositions have come to be seen as the indispensable foundation for correct biblical exegesis. Since its introduction in 1830, dispensationalism has branched into more than one variety. Like many American evangelicals, I was once a dispensationalist without knowing it. I was unacquainted with the label. My teachers did not inform me that they were teaching me to interpret the Bible through a mental grid that had been constructed less than 150 years earlier. I had no inclination to investigate the relative merits of my system against those of any other— simply because I didn’t know there was anything to investigate. I had the impression that ours was the only way sensible people had ever viewed Scripture. In other words, I was not educated, but indoctrinated. It was not until my own studies in Scripture compelled me to rethink some aspects of my theology that I became aware of the degree of that indoctrination. Dispensationalism is a theological system emphasizing the ways in which God relates differently to mankind during distinct eras, called dispensations. The history of mankind is viewed as a succession of dispensations, each defined by a distinct covenant by which God binds men to specific obligations relative to that particular dispensation. The ramifications of these views affect a number of theological issues. Christian theologians have always recognized different administrative epochs in God’s dealings with humanity—as, for example, the distinct economies inaugurated by the fall, by the exodus, and by the advent of Christ, respectively. However, the system known as dispensationalism was not formulated earlier than 1830. It was introduced by John Nelson Darby (1800–1882), an early leader in the Plymouth Brethren movement. At age nineteen, while still a student at Trinity College in Dublin, Darby came to believe that there must be a future dispensation in which God will literally fulfill His Old Testament promises to national Israel. He saw this as a “rediscovered truth” that had been lost in the generations following the apostolic age. From this premise, several other innovations in theology arose (to be considered below). f Darby’s suggestion about the future of Israel does not seem theologically novel to modern evangelicals, it is due to the remarkable success his opinions have enjoyed in capturing the evangelical imagination. Prior to Darby, Christian theologians almost unanimously taught that the promises made to Israel have found their fulfillment in Jesus Christ. Darby believed the former theologians had erred through their failure to employ a thoroughly literalistic hermeneutic. In traditional theology, many prophetic passages concerning Israel and Jerusalem had been spiritualized and applied to the church. According to Darby’s teaching, such passages should be applied to ethnic Israel, not to the church. As a result of this hermeneutical commitment, Darby’s views placed Israel, not the church, at the center of God’s eschatological interest. The church, then, was said to comprise a parenthesis, occupying the interim between Israel’s rejection of Christ, in the first century, and the restoration of Israel to God in the end times. Darbyism, as it is sometimes called, became popular in the United States through a variety of media, not least of which was the publication of the Scofield Reference Bible in 1909, whose notes, printed at the foot of each page, provided dispensational explanations of the associated biblical text. This publication had far-reaching influence on many evangelical readers, who often read Scofield’s notes as though they carried some kind of canonical authority due to their placement on the pages of Scripture. Even before the publication of the Scofield Reference Bible, in the last quarter of the nineteenth century, dispensational beliefs were being disseminated in the United States through the Bible Conference Movement and numerous Bible institutes, which were founded across America to promote the new teaching. Among those that arose in the late 1800s were The Nyack Bible Institute, The Boston Missionary Training School, and The Moody Bible Institute. Later, in 1924, dispensational theologian Lewis Sperry Chafer established Dallas Theological Seminary, which has trained many of the prominent dispensational broadcasters, best-selling authors, and commentators of our day. For many Christians, fascination with the end times translates into fascination with Darbyism. Of the controversies surrounding dispensationalism’s various theological innovations, those that are most popularly discussed are the eschatological distinctives of the system—which include the expectation of an end-time regathering of the Jews to the land of Israel, the pretribulational rapture of the church, and the restoration of Jewish forms of temple worship during the millennium. The futurist view of the Book of Revelation, which, prior to Darby, had been rejected for centuries by Protestants, also gained respectability and popularity among evangelicals after it was wedded to the dispensationalist scheme. Even if its eschatological outlook on the future has received the greatest attention in popular sermons, novels, and movies, dispensationalism is not merely a distinctive program for the end times. Many aspects of the system have greater impact on the Christian message than does its view of the winding down of world history. Some of the issues affected have more practical bearing on daily Christian life. Previous to Darby, it was customary for biblical scholars to view many of the Old Testament prophecies concerning “Israel” as having a spiritual, not literal, fulfillment in the church. Dispensationalists say that they differ from their nondispensationalist counterparts in this important characteristic, and that they alone consistently take the Bible literally. Dispensationalism also departs from earlier Christian theology by making a distinction between God’s ultimate intentions for Israel and the church, respectively. The church and Israel, dispensationalists insist, must never be confused nor intermingled. The upshot of this view is that every promise that God ever made to Israel must be fulfilled literally, and not through the church. John Feinberg observes, “Only dispensationalism clearly sees a distinctive future for ethnic Israel as a nation.”3 Modern developments in the Middle East—especially the reestablishment of the nation of Israel in 1948—are often viewed as confirmations of the dispensational expectations that Israel is about to enjoy the fulfillment of God’s ancient promises to the patriarchs. The burden of the teaching of Jesus and the apostles in the New Testament concerns the coming and the nature of the kingdom of God. Historically, Christian theologians taught that Jesus came as the Davidic King, in fulfillment of the messianic prophecies of the Old Testament. At His first coming, He planted His kingdom, likening it to a mustard seed and to leaven in a lump of dough. Thereafter, His rule began to spread and permeate the world through the preaching of the gospel. The manifestation of His kingdom on earth is that society that recognizes His kingship, or the church of Jesus Christ. Darby believed that the kingdom promises were not fulfilled in Christ’s first advent, and that they require the political restoration of Israel and the coronation of the Messiah on the physical throne of David in Jerusalem. Such a messianic kingdom failed to materialize at Christ’s first advent, they say, due to the Jews’ rejection of their King. The messianic (Davidic) kingdom is thus said to have been postponed, not to be established until the second coming of Christ and His millennial reign. Due to the postponement of the kingdom, a new dispensation, the Church Age, has intervened, introducing another gospel—“the gospel of grace”—which was first preached by Paul. According to Ryrie, “The apostle Paul was principally, though not exclusively, the agent of the revelation of the grace of God for this dispensation.”8 It is Paul’s gospel that we are to be preaching today. Only after the rapture of the church (the close of the present dispensation) will the gospel of the kingdom again be relevant. Contemporary dispensationalists are not all of one stripe. There has been development within the movement, resulting in three different kinds of dispensationalists. This is the label given to the earliest forms of dispensational thinking, as found in J. N. Darby, C. I. Scofield, and Lewis Sperry Chafer. God is said to have two “New Covenants.” One “New Covenant” applies to the church in the present time, and another “New Covenant” is for Israel, applicable to the future millennial kingdom. This recognizes two “peoples of God”— God’s eternal “heavenly” people, the church, and God’s eternal “earthly” people, Israel. One writer who still holds to the classical approach is Miles Stanford (author of The Green Letters9). Yet further modifications of dispensational theology have been expounded by Craig A. Blaising, Darrell L. Bock, and Robert L. Saucy. They do not recognize such a stark discontinuity between Israel and the church as did the earlier dispensationalists. These scholars modify the idea of a complete postponement of the Davidic kingdom and, drawing closer to traditional Christian theology, recognize the church as the Davidic kingdom in an “inaugurated phase” of fulfillment. Christ is now believed to be reigning on David’s throne from heaven and will later do so from a physical throne on earth, during the millennium. Since Darby acknowledged that his system represented a departure from historic Christian theology, it is not surprising that, when it first appeared, the system received criticism from those who still embraced those “historical truths” with which Darby’s “rediscovered truths” were in conflict. The controversy continues, since many still do not believe that the things Darby “rediscovered” were “truths” at all. The most accurate way to state the case is that all biblical interpreters interpret some things literally, and some figuratively. The dispensationalists are not more consistent than are the nondispensationalists in the application of a literal hermeneutic—nor is that necessarily a criticism. The incongruity would seem to be in the dispensationalist’s claim to differ from others in this respect. The dispensationalists postulate two distinct “gospels” for two different dispensations. Jesus, they say, preached the “gospel of the kingdom” to Israel (Mark 1:14), while Paul preached the “gospel of grace” to the Gentiles. One serious defect in this suggestion is that the term “gospel of grace” is found in only one passage of Scripture—Acts 20:24–25—in which Paul equates this gospel with his preaching of “the kingdom of God.” The two gospels are one and the same. Paul was particularly intolerant of the idea of more than one “gospel” (e.g., Gal. 1:8–9; 2 Cor. 11:3–4). When Jesus came, the kingdom that the Jews anticipated was a Davidic one—namely, a political empire in which one of David’s sons would rule eternally from David’s throne (2 Sam. 7:12, 13). Jesus’ announcement of the imminent kingdom was understood by the Jews in this light, and raised questions among them as to whether He might, in fact, be the anticipated “Son of David” (Matt. 12:23). Classical and Revised Dispensationalists believe that Jesus indeed came with this in mind, and, if not for the Jews’ rejection of His offer, His coming would have resulted in His reigning on David’s literal throne in Jerusalem. They believe that this kingdom was postponed until the second coming of Christ, when Jesus will sit on David’s throne during the millennium. The theological difficulties that these propositions present are significant. In scripture, the Jews did not reject Jesus as a political king. In fact, they wanted to “take Him by force to make Him king” (John 6:15). It was He, not the Jews, who quashed that idea. His kingdom, He said, was “not of this world”—meaning not of worldly origin (John 18:36). In speaking to Nicodemus, He described it as a spiritual phenomenon, which can neither be seen, nor entered, other than by spiritual rebirth (John 3:3–5). Dispensationalists and nondispensationalists agree that it is the coming of Jesus that brings the Davidic kingdom. But nondispensationalists place this fulfillment at the first coming of Christ, and dispensationalists place it at the second. Which is it? There is nothing in Scripture to suggest that the kingdom was or would be postponed. John the Baptist and Jesus both proclaimed that the kingdom was “at hand” (Matt. 3:2; Mark 1:15), and Jesus later said that the kingdom of God “has come upon you” (Matt. 12:28) and “is within you” (Luke 17:21). It was not derailed or postponed, but came powerfully in the person of the King Jesus (Acts 17:7). When Jesus rode into Jerusalem on Palm Sunday, the people celebrated what they hailed as “the kingdom of our father David that comes in the name of the Lord” (Mark 11:10). Clearly, they believed and declared that the Davidic kingdom was coming in the donkey-mounted Messiah Jesus (cf. Zech. 9:9). Apparently, they were not mistaken, because Jesus said that if they had stopped saying such things, “the stones would immediately cry out” (Luke 20:40). Even the rocks knew that the Davidic king was riding to power! Contrary to dispensationalism, the Davidic promises cannot be fulfilled at the second coming. The promise that a descendent of David’s would establish an eternal kingdom was to take place at a designated time: “when you [David] rest with your fathers” (2 Sam. 7:12). In other words, this would be fulfilled at a time when David was dead and buried. This would fit the first advent of Christ admirably, a point not lost on Peter when he preached: “David…is both dead and buried, and his tomb is with us to this day” (Acts 2:29). Conditions were thus in place for fulfillment. At the second coming, David will be resurrected and will no longer be resting with his fathers. Fulfillment at that time would not fit the wording of the prophecy. Both Peter and Paul affirmed that the promises made to David had come true in Christ’s heavenly enthronement (Acts 2:30–36; 13:33–34). Paul defines the kingdom as a spiritual reality (Rom.14:17) into which Christians have already been “translated” (Col. 1:13). No verse in Scripture mentions Christ’s failure to accomplish His mission. There is no intimation that the kingdom has been postponed until a later time. An oft-repeated mantra of dispensationalism is that “the church and Israel are never confused in Scripture.” However, the fact that the true Israel (or the true “circumcision”) is not linked to ethnicity, but is identified with followers of Christ, is stated unambiguously by Paul (Rom. 2:28–29; 9:6; Phil. 3:3), who also said that the true heirs of Abrahamic promises are not the “children according to the flesh” (ethnic descendants), but the “children of the promise” (Rom. 9:7–8; Gal. 4:23, 30). To avoid any confusion, Paul then identifies the latter with his Christian readers—hence, the church (Gal. 4:28). All who belong to Christ are included in the “seed” of Abraham, and are, therefore, the heirs of the promises (Gal. 3:29; 4:30–31). In view of these things, the dispensational assertion that the church is never meshed with Israel is indeed perplexing. Either all the Christian scholars prior to 1830 have been wrong about the central teachings of the New Testament or else the dispensationalists are wrong. When considering the biblical merits of each position, it is necessary to discern whether we are seeing the text as it reads and was intended, or whether we are reading the text through a preferred grid, supplied by the teachers whose influence first shaped our thinking as Christians. Simply to raise the question is more than many believers have done. “The first one to plead his cause seems right, until his neighbor comes and examines him” (Prov. 18:17). Steve Gregg is the author of Revelation: Four Views: A Parallel Commentary, and host of the radio show The Narrow Path (www.thenarrowpath.com). He lives in Temecula, California. Charles C. Ryrie, Dispensationalism Today (Chicago: Moody, 1965), 86–87. John Walvoord, The Millennial Kingdom (Grand Rapids: Zondervan, 1983), 63. John S. Feinberg, “Systems of Discontinuity,” Continuity and Discontinuity: Perspectives on the Relationship between the Old and New Testaments, ed. John S. Feinberg (Wheaton, IL: Crossway, 1988), 83. C. I. Scofield, Scofield Reference Bible (New York: Oxford University Press, 1917), 1148 (note on Acts 1:11). L. S. Chafer, The Kingdom in History and Prophecy (Philadelphia: Sunday School Times, 1919), 71. Charles C. Ryrie, Basic Theology (Wheaton, IL: Victor, 1986), 398–99. Quoted from G. E. Ladd, Crucial Questions about the Kingdom of God (Grand Rapids: Eerdmans, 1952), 50. Charles C. Ryrie, Dispensationalism (Chicago: Moody, 1995), 56. Miles J. Stanford, The Complete Green Letters (Grand Rapids: Zondervan, 1983). Larry Crutchfield, The Origins of Dispensationalism: The Darby Factor (Lanham, MD: University Press of America, 1992), 23–42. Curtis I. Crenshaw and Grover E. Gunn, Dispensationalism Today, Yesterday, andTomorrow (Memphis: Footstool Publications, 1987), 38. All Bible quotations are from the New King James Version.